Should PewDiePie be kicked out of YouTube? He might have an audience of millions, and undoubtedly has achieved celebrity status worldwide, but it’s likely that PewDiePie’s most recent controversial video has already gotten him in quite a bit of trouble. This video, which showed a pair of comedians behaving in a silly manner before one of them held a sign with a strong anti-Semitic message, has already become one of the most controversial videos on YouTube ever. 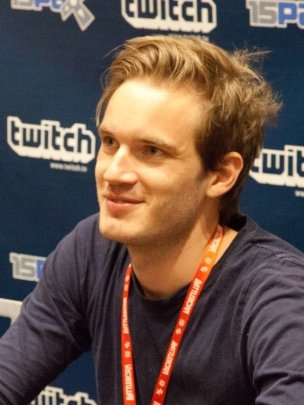 And The Walt Disney Company, which had established a partnership with Swedish star PewDiePie (whose real name is Felix Kjellberg) through their Maker Studios, clearly did not find the video funny at all, with a spokesperson saying that the YouTube comedian had gone “too far” this time and that the company was cutting links with the YouTuber. Disney was not the first company to break ties with Kjellberg, as YouTube also cancelled the star’s Scare PewDiePie show (which was soon to get a second season) and removed him from Google Preferred (an ad platform for the top content creators), as reported on Polygon. Felix Kjellberg (aka PewDiePie) became a YouTube celebrity with his boundary-pushing humour, but he might have gone a bit too far recently. Of course, Google did not go as far as kicking the Swedish star out of YouTube, even though his recent racist videos have caused something of an uproar and are in violation of YouTube’s guidelines. These prohibit dealing with subjects and events which are controversial or sensitive, including those “related to war, political conflicts, natural disasters and tragedies, even if graphic imagery is not shown”. Removing PewDiePie from YouTube seems like an extreme measure to take, though, even if the man himself actually threatened to delete his own channel last December. But it’s clear that the comedian went too far with his latest video, which delivered one very anti-Semitic message for purely shock value, and truth be told, in a very tasteless way. It remains to be seen whether PewDiePie’s channel takes a hit and ends up losing subscribers as a result of this, though, but it’s clear that Kjellberg explanations about the video’s content, saying that he “was trying to show how crazy the modern world is”, are simply not convincing. But still, it is unlikely YouTube will take down the Swedish star as he is one of the most popular personalities on the Internet and also one of their top earners, although it’s clear he might have damaged his reputation for good this time. But even if PewDiePie crossed the line with one of his latest videos, it would still be a good thing if he kept delivering the same cutting edge humour he has to date, and that funny video game commentary that made him famous in the first place.